Rose Retreat is a beautifully renovated 2 bedroom gite, located on a quiet Domaine with a very large garden and a wonderful shared swimming pool. There are a lot of facilities at this property, including a fabulous summer house with hot tub, a boules court, a ping pong table and several terraces, one with firepit, perfect for 'al fresco' dining. Aircon, internet, UK satellite TV are all included in the villa. 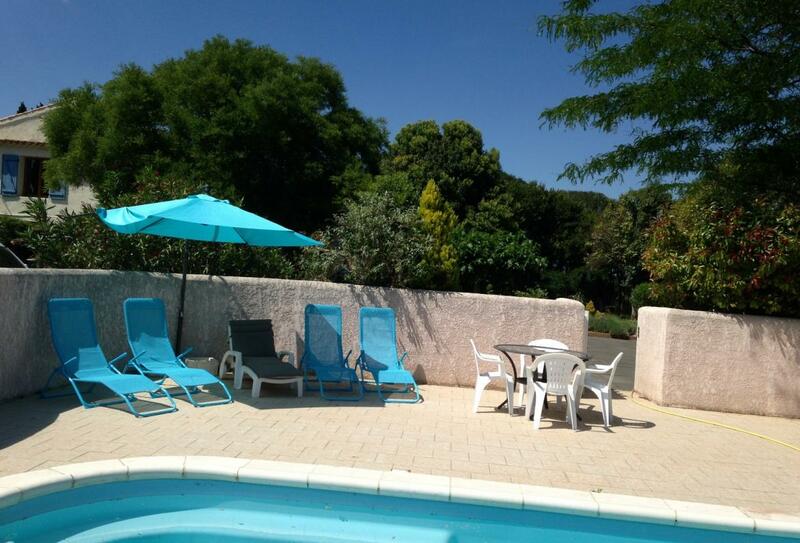 Located just outside Beziers, it is only a 15-20 minutes drive to the beaches at Valras Plage. 2 bedrooms / 1 bathroom. Sleeps 4. INSTANT BOOKING AVAILABLE ON THIS PROPERTY. Rose Retreat is a wonderfully furnished and decorated 2 bedroom gîte, located on a private and family owned Domaine, surrounded by beautiful fields and vineyards. The gorgeous outside terrace areas offer privacy and comfort, as well as pretty views and atmosphere. Enter the property from a rural road, through electric gates and down the impressive drive towards this wonderful Domaine. The gîte forms part of the main house of Domaine du Pin, part of which was built in 1832 with further extensions built on over the years, making it the comfortable family-owned home that it is today. Home to a friendly English family who have lived and worked in the area for 16 years, they will be available to help you with your every wish and need; with deciding where to spend the day or to help arrange any trips for you, with the possibility of baby-sitting services as well. The accommodation consists of an air-conditioned open plan room, complete with a smart kitchen area, breakfast bar, a seating area, wifi, and French doors opening onto a large private terrace, where you will find a table and chairs for outdoor dining, a garden sofa for relaxing, a BBQ, a parasol and sun-loungers for those relaxing days spent reading in the sun. The indoor seating area consists of two sofas, a small flat screen TV with UK satellite channels, and a coffee table. There is a second open plan room with a kitchen area, dining table for 2 with doors onto another large and private terrace located at the front of the property. There are two bedrooms in the gîte, one with a double bed and the other is a twin. Both bedrooms have a wardrobe and air-conditioning, and windows to the rear of the property, with a view over the back garden. The bathroom is spacious and has a walk in shower, basin and bidet, separate WC and a washing machine. Please read the many Testimonials for this property as they will give you a good idea of the property, facilities and location. The outside space of Domaine du Pin is impressive and is where the property sees its charm. A large 8m x 4m swimming pool (enclosed by a wall and gate) is shared with the occupants of the second gite (just 2 people) and very occasionally with the owners. The garden is very large with lawn areas, olive trees, fig, apple and pear trees, mature shrubs and Mediterranean plants. There is a newly built summerhouse, built with driftwood and using a beachy theme. Here you will find a shaded dining area, a comfortable area for relaxing or reading as well as the hot tub. Exterior lighting for those late night swims and jacuzzis! In the garden you will find our new boules court and on the terrace is the ping pong table plus a football goal in the side garden area. There is secure private parking located at the bottom of the garden. - Kitchen area with dishwasher, electric oven and 4 hobs, extractor fan, fridge freezer, washing machine, kettle, toaster. - Living area with 2 sofas, flat screen TV with UK satellite channels, Wifi internet, aircon. - Dining areas, interior breakfast bar with 4 stools and exterior dining area with table and chairs. Hall cupboard for storage of suitcases, baby equipment etc. The Domaine is located just outside the charming city of Béziers. Situated in the countryside, it benefits from a peaceful location but at the same time it is only a few minutes drive to several pretty villages with all amenities and 20 minutes to the long, sandy beaches. Béziers itself is only a 5 minute drive away, and is a lovely city that sees many tourists every year, joining together to enjoy the wonderful architecture and cobble-stoned roads. The main square of Béziers offers stunning renovated façades displaying the beauty of old-age Béziers. There are activities for everyone in this area, you will be spoiled for choice. Traditional markets (don't miss the Saturday one in Pezenas), restaurants, bars, walks or bike rides along the Canal du Midi, home-made rum on a river-boat bar, bike rental, laser game, nightclubs, water parks, fabulous shopping, bowling alleys, cinemas, chateaux, wine tasting, superb sandy beaches, medieval villages .. the list goes on and on. Béziers is wonderfully located right in the middle of all of the activities that make Hérault what it is. The beaches are only 15-20 minutes away, complete with golden sand and delicious seafood. The medieval city of Carcassonne is only an hour away, full of its cobble-stoned roads and traditional shops and restaurants, all seemingly completely untouched. A visit to the medieval castle is an absolute 'must'! The bustling student city of Montpellier is only 45 minutes away, full to the brim of restaurants and bars and nightclubs, as well as every activity that you could possibly imagine including a fabulous aquarium, a planetarium, ice skating and go-karting. Narbonne is a favourite amongst locals thanks to the laid-back atmosphere that the city provides you with, as well as a beautiful walk along the canal, and a mouth-watering wander around the local market. If you're looking for something traditional and typically French, then we recommend driving 40 minutes to Saint Chinian and its surrounding villages and towns such as Roquebrun, Assignan, Agel, Bize Minervois and Trébes are all wonderful days out in the gorgeous countryside. A couple of our favourite places to visit are Pézenas, Saint Guilhem le Désert and Minerve, all absolutely stunning villages full of history and beautiful architecture, these small villages have a lot of character and will forever be a reminder of your time in France. On a rural road just off the main D612 and about a 10 minute drive into the centre of Beziers. 20 minute drive to the beaches at Valras Plage. 15-20 minute drive to Narbonne. 45 minute drive to Montpellier. I hour drive to Carcassonne and Perpignan. 5 minute drive to the A9 junction 35. Bed linen, towels and pool towels included in price. The English owners live on site and they will be able to give you all the information and tips that you need. Places to go, things to see, restaurants etc. Taxi service available if you want to go out for the evening and not worry about driving. There is a family dog on site, Maddie, who is a young, very friendly Labrador/Collie cross. No pets as owners have a small Shitsu dog on site as well as 3 cats. Welcome basket on arrival with all starter basics ie coffee, tea, milk, sugar, wine, water, orange juice, pasta and provençale sauce, biscuits and crisps as well as a few dishwasher and washing machine tablets to get you started. This gîte actually provides you with everything that you will need for your first night if necessary - a drink and a pasta meal from the Welcome basket - but also all the extras including toiletries, toilet rolls, kitchen roll, bin bags, hand soap, washing up liquid etc so you do not need to go to the shops on your first night at all if you wish! If you would like the owners to get in a bit of shopping for you then please just ask and they can provide cheese, ham, fruit, baguette, cereal or whatever you fancy. Read the Testimonials from our guests this year - nothing is too much trouble! LONG TERM WINTER LETS available on this property - please ask for details. The property photos and description was accurate and our expectations were exceeded. It was good value for money and the cleanliness on arrival was excellent. Lovely location; ideally situated for exploring the delightful villages of the Canal du Midi and their restaurants! The gite is bright with great attention to detail and the outside space is amazing! Delightful terrace and wonderful pool, perfect for all ages. Juliana and family couldn't have done more to make us feel welcome, nothing was too much trouble. We liked and loved: The Pool! The Patio. Candlelight. The dogs and cats. The Welcome Basket and wine and the welcome from Juliana. Wi-Fi. The Hoopoe mum and babies in the eaves. Big garden. Kitchen and all the necessaries. Good shower. Excellent storage. The compactness of the gite. The privacy and laissez-faire but always someone on hand with help and advice. We recommend: Pizz'a Nous in Maraussan main street; canoeing and swimming at Roquebrun; ancient and lovely Olargues; more Mojitos; Cassis; the 'sixties' chair; the sound of the tree outside; late nights on the patio; one last Mojito! Thank you Juliana, Mary and Jake for your warm welcome and ready advice for all daft questions and recommendations. We've had a brilliant week. Good luck and a bientot. What a fantastic Gite and location! We have enjoyed lazy days around the pool and candle-light evenings. We have visited and enjoyed Carcassonne, Aqualand, La Grotte des Demoiselles (caves), Serignan beach, Canoeing at Roquebrun, Le Petit Nice restaurant (Roquebrun, great pizzas and friendly staff). If you fancy a night with a difference, try Toro Piscines at Cap d'Agde, very entertaining watching the young men running from the bull!! We also enjoyed our evening with Juliana at the Feria in Beziers. So much to do, not enough time, we must visit again soon.